Stuttgart (DE) hosted the HiPEAC Computing Systems Week from Oct 25 to Oct 27, 2017. Considering that in Stuttgart are located large automotive companies, such as Bosch, Daimler, and Porsche, and about 1500 SMEs, the focus of this event was on mobility. Mobility is of crucial interest for computing community in Europe. We had two representatives there from DISA Sabri Pllana, from Computer Science at Linnaeus University and Henrik Jansson, logistics from Södra. According to Sandro D’Elia, Programme Officer in the Technologies and Systems for Digitising Industry Unit of the EC DG CONNECT, in 2022 an average car will comprise electronic components worth € 6000. The trend towards cooperative and autonomic mobility poses many Big Data challenges that we need to address in the upcoming period. 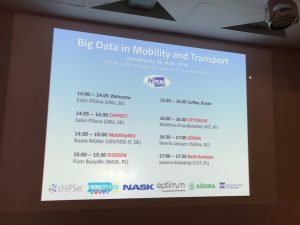 Therefore, five European projects (CHIPSET, Mobility4EU, SISSDEN, OPTIMUM, BalticSatApps) and a large Swedish company (Södra) met in Stuttgart to discuss about “Big Data in Mobility and Transport.” Presentations of participants highlighted various complementary aspects including, computer science methods and infrastructures for Big Data, visions for future of mobility in Europe, security aspects, and multi-modal vehicle routing optimization. During discussion the participants discovered areas for future cooperation, and future dialogue between participants (such as, AIT and Södra) was planned. Sabri and Henrik are grateful to HiPEAC for providing an excellent meeting infrastructure and we are looking forward to here more about future cooperation. Michael Seadle, Executive Director of iSchools and the Dean of Faculty of Arts at Humboldt University and Sam Oh, iCaucus Chair-elect and the Head of School of Library & Information Science and Data Science Department at Sungkyunkwan University will be talking about the emerging information field, organisation of iSchools and the potential it has for Linnaeus University and the region. The core idea is to establish iSchool (information School) at Linnaeus University. An iSchool refers to university-level research and education in the information field (iField) which relies on interdisciplinary approaches to enrich and facilitate generation, transfer and curation of data, information, and knowledge by the widespread use of technology in order to maximize the potential of humans. The iSchools Organization today involves over 70 prestigious universities from around the world such as: University of California, Berkeley; University College London; University of California, Los Angeles; Cornell University; Carnegie Mellon University; University of British Columbia; University of Hong Kong; Humboldt University of Berlin, to mention a few of those ranked among the top 50 universities in the world. The University of Washington was one of the first iSchools that was instrumental in developing the iSchools movement into what it is today.